Find a variety of wedding favours and party favors including favor bags, lace and paper fans, candy bags, maple favors, globe favors, and favour boxes in many materials and colour options. Favors are a perfect way of making you reception unique to you. Whether you are looking for a personalized chocolate bar, a vintage jar to fill with your favorite sweets, or salt and paper shakers in the shape of lovebirds, at Edmonton Wedding & Party Centre we have you covered! Drawstring favour bags are the perfect gesture of thanks. 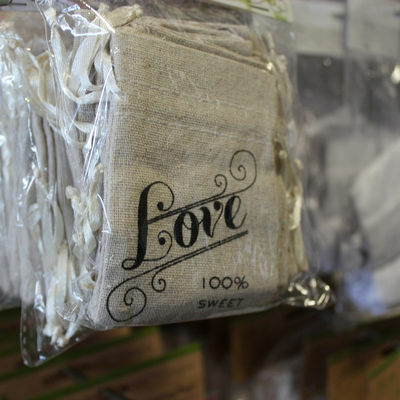 From burlap to organza, canvas to lace, drawstring favour bags are a fun way to spruce up any place setting. Fill with a favorite type of candy, sweet treat or savory snack, for an irresistible thank you. At Edmonton Wedding & Party Centre we are a fan of paper fans! No matter what type of event you are planning, our paper fan favours are the perfect way to help keep your guests cool. Some fans are available with personalization, so please inquire within for more information. Surprise your guests with a fantastic specialty favour. From personalized glassware to gum ball machine and everything in between, Edmonton Wedding & Party Centre offers hundreds of wedding favour options. Shop in store today to see our extensive offering of favours. Simply put, favour boxes are a classic wedding favour. Available in numerous colour options, styles and size, favour boxes are an easy way to incorporate your wedding theme, while saying thank you.